I recently received a very interesting e-mail from a person I have corresponded with a few times in the past. This mail concerns the topic of the postmark that was stamped on the envelope that Lee Harvey Oswald mailed to Klein's Sporting Goods in Chicago in March of 1963, which was an envelope that contained Oswald's order form for the rifle which he eventually used to kill JFK in November. I'm going to omit the name of the person who wrote me this e-mail, because I'm not sure if he would want his name revealed on the Internet. Since receiving this message on July 6, 2012, I've been hoping to receive a follow-up mail from this individual regarding the "absolute confirmation" he speaks of in his e-mail message, but thus far I have not received any additional correspondence from him. But since this matter concerning the envelope's postmark and Oswald's order form for the rifle has been a topic of considerable interest to many conspiracy theorists over the years, I thought I'd share this apparently "new" information regarding the postmark. Some months ago you very kindly helped me with a question that I had about the postmark on CE-773 - the envelope in which Oswald posted his coupon for the rifle. After a long (and intermittent) search, I think that I may have come up with an answer - and it conflicts with the claims made by those who maintain that the number ‘12’ denotes a distant part of Dallas. I’ve been told by a group of postmark collectors and historians (in the USA) that the number ‘12’ which appears on the franking/cancellation mark does not indicate where the item was posted. It merely indicates that the letter was franked through the number 12 machine at the processing plant, which was, in 1963, within the terminal annex building where Oswald actually bought the money order! No mysterious journey required, it would seem. I have also been advised that the time-stamp shown on the franking, 10:30, does not mean that it was posted at that time. It simply means that the letter was in the mailbox when the scheduled 10:30 collection was made. The only thing that can be said for sure is that the letter was posted at some time before the timestamp shows. It could have been one minute, one hour, two hours, three hours, etc. I’m currently seeking absolute confirmation of these matters from the USPS historians and archivists. If you’d like me to contact you again, when I’ve got the confirmations, I’ll be delighted to let you know. My dad worked as a clerk for the local post office, and I can confirm one of the comments made by DVP's "source." The time of the postmark does NOT indicate what time the letter arrived at the postal facility; it simply signifies that it was at least 10:30 am when the envelope went through the cancelling machine. The envelope may have been deposited in a drop box, possibly the day or evening before. So there was no requirement to believe that Oswald went to the counter at the post office, handed the envelope to the clerk, and the clerk cancelled the envelope at the moment he/she received it. Yes, Mark, I think that point is all too obvious, because just common sense alone would indicate to everyone that the 10:30 mark on Oswald's envelope certainly doesn't mean he dropped it in a mailbox at precisely 10:30 AM. It just means he mailed it sometime before 10:30. The key point, however, in the e-mail that I provided is the part about the "12" marked on the envelope. You'll notice that the "12" is stamped AFTER the word "Tex." [Texas] on the envelope, instead of being placed between the city and the state. "Chicago 6, Ill.", which is also the way the Chicago address appears in the Klein's ad that is seen in CE773. Whether or not it's significant that the number "12" appears after both the city and state in the CE773 postmark, I really have no idea. But it suddenly struck me today that the city and state portion of the postmark isn't written the normal way you see an address written out in the "pre-zip code" days (if, that is, the "12" indicates a specific postal zone within the city of Dallas, Texas). Exhibit 773] has turned out to be rather 'inconclusive', unfortunately. I have been asked to look into your question regarding the significance of the number “12” inside the cancellation from March 12, 1963 in Dallas TX. My initial thought also was that this was a zone number used in larger cities before the widespread adoption of ZIP Code. But the information you obtained from the Postmark Collectors Club has given me pause to reconsider. The idea that the "12" identifies a specific cancelling machine is entirely plausible, but thus far I have been unable to confirm or deny that theory. I spoke with Evan Kalish from the Postmark Collectors Club about this and his opinion is based on anecdotal knowledge of the club's members. I have no reason to doubt their expertise, but I have been unable to corroborate that with any reference materials in our files. Since this question is bound to come up again, it would be of great value if we could cite an authoritative source. In the meanwhile, I shall continue to scour our files for documentation on this question. I am sorry that I was unable to provide the information you requested. Not quite what I'd hoped for, but good enough to show that the 'district 12' notion cannot be supported. Why would the Post Office want to put the number of a cancelling machine on its postmarks? Don't understand why this was so difficult to work out. Fort Worth happens to be on the border of the 12th Congressional District of Texas. stamp and M is for a meter). cates continuous usage and a slash (/) indicates missing years. die, which is probably what the D30 designation represents. There are collector geeks obsessed with this stuff and this probably could have been nailed down decades ago. 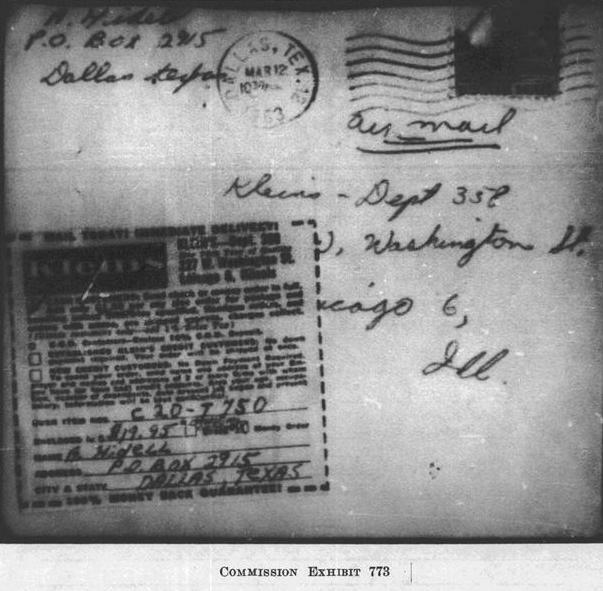 So it looks like we have one more conspiracy theory we can throw in the trash, because there now seems to be ample reason to conclude that the "12" seen in the postmark in CE773 (the envelope Lee Harvey Oswald mailed to Klein's in March of 1963) has nothing at all to do with any specific postal zone in the city of Dallas, Texas. And if my e-mail source is correct, the number "12" cancelling/franking machine was located right there at the Main Post Office in Dallas in 1963, which makes perfect sense, of course, since that was the place where we know Oswald bought his $21.45 money order that he sent to Klein's on 3/12/63. It's nice to know that there are "geeks" in virtually all categories of life -- even "Postmark Geeks" who belong to the Post Mark Collectors Club. I'll bet I get a response within a few hours. We'll see. Some of your links don't work, and while some of Tom's also don't work, one even triggered a threat warning for malicious software embedded at the site. Nice sources. And maybe it's just me, but as usual, Tom's method of posting information is confusing. I really can't make head nor tails of what he has posted insofar as it may relate to the question at hand. The idea that the "12" identifies a specific cancelling machine is entirely plausible, but thus far I have been unable to confirm or deny that theory. Since the official Postal Historian can't confirm or deny any theory at this point, I think it's a bit premature to proclaim "case closed". His best guess that "12" is a Zone number and "12" representing a congressional district in the greater Dallas area may be no more than coincidence, but maybe you could run it past him, just the same? It could not have been mailed the night before or any time before the MO was purchased - right? any explanation for why this overlaps the mark we see and why it does not match .. The other thing that bothers me is the KLEINS stamp that Waldman says "Looks identical" to their stamp... on the back of the MO..
All of the links in my last post resolved to the pages they were supposed to resolve to, using a Mozilla firefox browser. This link, the last in my post, http://machinecancelforum.50megs.com/TX.txt did not resolve when I tried using the awful IE browser. I got a "you are not authorized to view these files from .... and the alert displayed my I.P. franking machine description could be found, right down to the comma in Dallas, Tex 12 with a description of the machine, its vendor, and the timeframe of observed activity in Dallas, the years 1958 to 1963. If you do not understand, it does not follow that I am frequently not meeting your expectations, in other posts, on other threads, that is garbage. Why engage in it? So? Firefox is every bit as crap as IE. But that's beside the point. I use avast antivirus software and this site http://www.machineca...an/ludeman.html triggers a trojan warning. IMO, a classic case of shooting the messenger, instead of reacting to the info actually in the message. You objected to everything but the information, Greg. Like horses, some messengers need shooting, Tom. It's hard to react to/object to the information when it's presented in such a way (and with links to sites my software warns me against visiting) that it is unintelligible to me. I did say "maybe it's just me". Maybe you missed that. You criticized me. generally, I know, you have it in for me. Get over it, it is unnecessary to convey your animosity in every reply to anything I post. I could not have made my post more clear. I supplied a link to a list of where the exact franking machine description could be found, right down to the comma in Dallas, Tex 12 with a description of the machine, its vendor, and the timeframe of observed activity in Dallas, the years 1958 to 1963. Which doesn't work in the browser I use and which is not Firefox or anything like Firefox. I never said it did follow. But both statements are still true. To be fair, in this case, I may well have been able to grasp your message if I had been able to access to the links. For others like me who may be chronically obtuse, maybe you could just spell it out in plain English, in 25 words or less? Cancellation machine number, when in fact there is a map of the city at that time with corresponding postal zone numbers? What has that got to do with the price of tea in China (or Dallas)? Just because a map exists that shows postal zone codes for Dallas, that fact means that the "12" on Oswald's envelope HAS to be a postal zone code?